Working from home certainly has its perks! Things like saving on gas, eating out less, and being closer to your family all add up, making home offices a great option for those who are able to do so. If you’ve worked portably for a while, you’ll know that some places in the home are better than others when it comes to maintaining concentration and creativity. Whether your commute is a trip up the stairs or down the hall, your home office should be a place where you can focus and work effectively. Keep in mind that furniture and decor will take up more room than you’d think! It’s better to plan a little bigger, and if possible, to account for separate areas or workspaces within the room. You shouldn’t ever have to feel trapped or uncomfortable in your home office! Light plays an important role in your home office. Not only is proper lighting important for your health and productivity, it improves your mood and state of mind. If you’re fortunate enough to have a window with natural lighting in your workspace, you’re one step ahead of the game! If your home office remodel involves creating a brand new space, consider building along an insulated outside wall where a window can be installed, or else think about options like sun tunnels or skylights. Depending on your line of work, you might have specific needs in terms of office layout and storage. 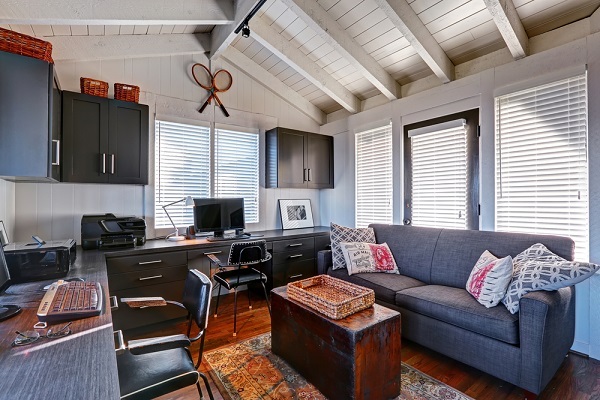 Plan for long-term investment in your home office remodel, and work in every aspect you might need as you grow and settle in the space. Whether that means custom cabinetry, desks, or shelving, our team is happy to work with you to meet your needs and make your space a valuable addition to your home. The fun part of office remodeling involves decor and furnishing. There’s no shortage of ways to brighten up your home office! Since you’ll be spending a lot of time in your new space, finding the right style is just as important as any other part of the remodeling process. It’s best to decorate immediately after a remodel, while you’re still in “project mode.” If you put it off too long, you risk settling for the bare minimum. Go all out with a great paint job, window treatments, lamps, area rugs, and all the furnishings you need. You certainly won’t regret it down the road! These days, there’s plenty of awareness regarding the negative health effects of sitting in place all day. That’s why it’s so important to have options within your workspace. These can include things like standing desks or large, wraparound workspaces that keep you moving from place to place throughout the day. If you have a tighter office space with a sloped ceiling, that can limit your options when it comes to both standing and desk placement. It’s important to consider health and comfort before a remodel, so you can best incorporate a range of options into your new workspace. 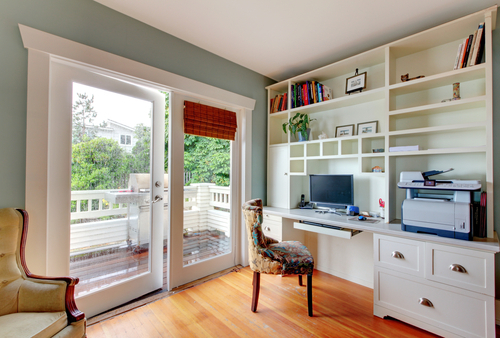 When it comes time to design and remodel the perfect home office space, don’t go it alone! The carpenters at Stohlman & Kilner have a wide skill set and can design and build a space that helps you perform at your peak! Reach out to us today, and let’s talk about your ideas!